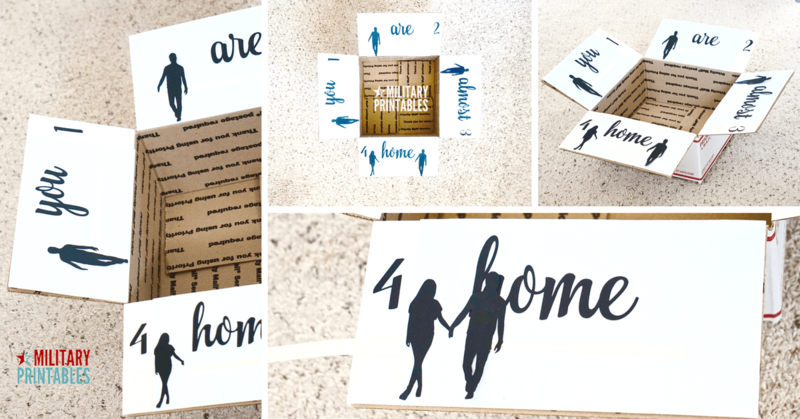 This is a great interactive care package idea. There’s a slider tab on all four care package flaps. The idea is that you slide the male icon closer and closer to the female icon. 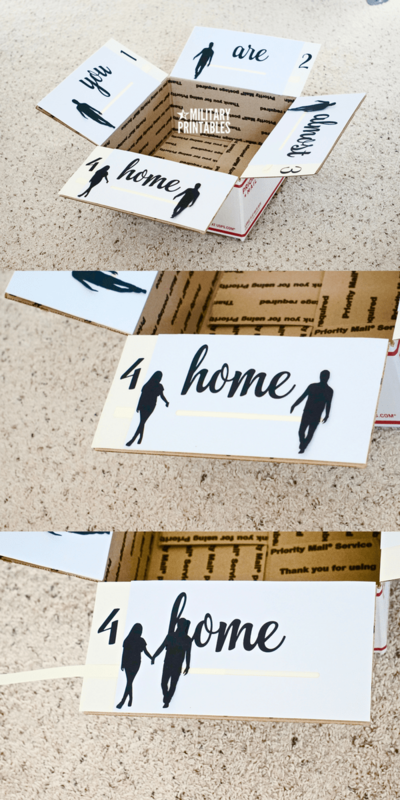 This would be a great care package idea if your reunion is soon or your loved one is close to coming home. Affiliate links used below on products I truly recommend. See full disclosure here. To start, you’ll need a slider front layer and a slider base layer. I cut a long slit in my slider front layer using this die and die cutting machine. Then I cut my slider tabs to be a little bit wider than the slit I made. I built a slider track using foam tape, and placed the foam tape on the back of the slider front. Then I cut out a small piece of foam tape, adhered one side to the slider tab, and one side to my slider element (the male silhouette). I decided on a silhouette of a couple. On the last care package flap, the male would be reunited with the female. Once you see that the slider tab moves back and forth with no issue, then you can add foam tape to the rest of the slider so it’s nice and level when you add your slider base. From there, I added my sentiment that I cut out with this silhouette cameo, and added numbers just in case my recipient doesn’t know which one to pull first. All and all, it was a really simple and interactive care package.